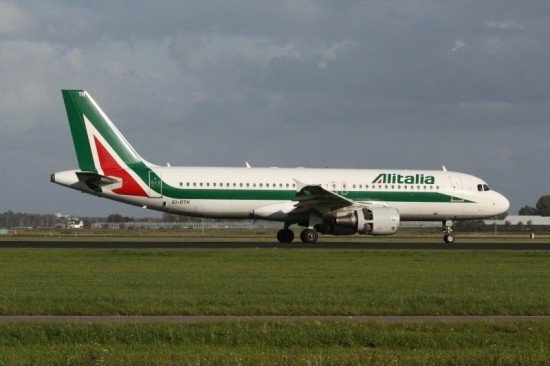 The Italian accident investigation board ANSV issued a preliminary report of their investigation into a serious low fuel emergency incident involving an Alitalia Airbus A320 in July 2011. The Airbus A320 aircraft, EI-DTL, had taken off from Milan-Linate at 06:16 UTC on a scheduled passenger flight to Rome-Fiumicino (LIRF). The fuel load was 5000 kg, including an extra 354 kg of fuel. The planned alternate airport was Rome-Ciampino. The flight was en route at about 60 nautical miles from Fiumicino when Rome ACC reported that the weather conditions had worsened. The flight was instructed to enter a holding pattern at the GITOD waypoint because of wind shears in the final approach path of runways 16L and 16R. Based on the current weather information the crew decided that Pisa Airport would be their alternate airport. The preliminary report does not state the duration of the holding, but at some point the flight was cleared to the TAQ VOR were further delay was to be expected. Meanwhile, runway 25 became the active runway for landings. The flight crew radioed that they needed permission for the approach shortly, otherwise the flight would divert to Pisa. After changing radio frequencies the crew received radar vectors for an approach to runway 25. As these vectors took the flight further from the airport, the crew requested a shortened route for the approach. Again the crew reported that they would otherwise be diverting to Pisa because of the amount of fuel remaining. The controller then cleared the flight to the LAT VOR, located about 34 nautical miles south-east of the airport, to perform a further holding pattern. He also stated that the preceding aircraft had not been able to land due to the adverse weather conditions encountered. At that point, the crew of the EI-DTL decided to abandon the approach and to divert to Pisa. Once en route, the crew calculated that the amount of fuel on landing would be less than the specified minimum (reserve final fuel). An emergency was declared and the flight was cleared for a direct approach to runway 04 at Pisa Airport, where it landed at 07.56 to UTC, without further problems. The preliminary report did not state the amount of fuel left upon arrival at Pisa.